Lawrence A. Kudlow serves as Assistant to the President for Economic Policy and Director of the National Economic Council. He leads the coordination of President Donald J. Trump’s domestic and global economic policy agenda. During President Trump’s campaign, Mr. Kudlow served as a tax and economic advisor. 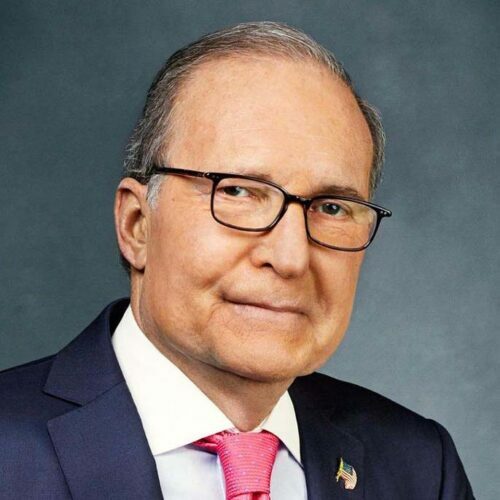 Prior to the White House, Mr. Kudlow was a CNBC Senior Contributor and host of CNBC’s primetime show “The Kudlow Report.” He also served as chief economist and senior managing director of Bear Stearns & Company. During President Reagan’s first term, Mr. Kudlow was associate director for economics and planning at the Office of Management and Budget, where he was engaged in the development of the Administration’s economic and budget policy. He previously served as the president of St. Patrick’s Church Parish Council in Redding, Connecticut and on the Fordham University Board of Trustees. Mr. Kudlow has won numerous awards, including the Bishop’s Humanitarian Award from the Catholic Charities of Brooklyn & Queens, the New York Police Department Holy Name Society’s Lifetime Achievement Award, and the Ambassadors for Mission Award from the Pontifical Mission Societies of the United States.